Geographic Information Retrieval (GIR) is concerned with improving the quality of geographically-specific Information Retrieval (IR), focusing on access to unstructured documents. Since GIR can be considered as an extension of IR, the application of Natural Language Processing (NLP) techniques, such as query expansion, can lead to significant improvements. 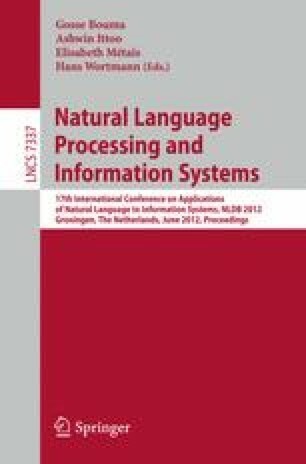 In this paper we propose two NLP techniques of query expansion related to the augmentation of the geospatial part that is usually identified in a geographic query. The aim of both approaches is to retrieve possible relevant documents that are not retrieved using the original query. Then, we propose to add such new documents to the list of documents retrieved using the original query. In this way, the geo-reranking process takes into account more possible relevant documents. We have evaluated the proposed approaches using GeoCLEF as evaluation framework for GIR systems. The results obtained show that the use of proposed query expansion techniques can be a good strategy to improve the overall performance of a GIR system.